Researchers on NASA’s New Horizons team have put together global topographic maps of Pluto and its largest moon, Charon, which vividly depict the stunning variety of terrains on both worlds. In a labor intensive project, a science team led by Paul Schenk of the Universities Space Research Association’s Lunar and Planetary Science Institute compiled all the images and data captured by the spacecraft’s Long Range Reconnaissance Imager (LORRI) and Multispectral Visible Imaging Camera (MVIC) and assembled mosaics of the two worlds, carefully aligning surface features in overlapping photos. Through digital analysis of stereo images taken by both instruments, they made topographic maps for each region, then integrated these to produce complete topographic maps for both Pluto and Charon. Returning the data captured during the July 2015 flyby of the Pluto system took approximately 1.5 years. As each new group of images arrived, mission scientists improved the quality of their Pluto and Charon geographic and topographic maps. The just-released maps depict every part of the two worlds lit by the Sun in the highest possible resolution, with individual elevations and a wide variety of terrains visible. Because some areas on Pluto and Charon were not illuminated by the Sun during the flyby, New Horizons was able to gather data on only 78 percent of Pluto and 45 percent of Charon. On the new map, viewers can see Pluto’s Tenzig Montes, the highest mountain range on the planet located to the left of Sputnik Planitia, the nitrogen glacier that constitutes the left side of Pluto’s iconic heart feature. The mountains’ tallest peaks reach 3.7 miles (six kilometers) above the range’s base, and their slopes are 40 degrees or greater. 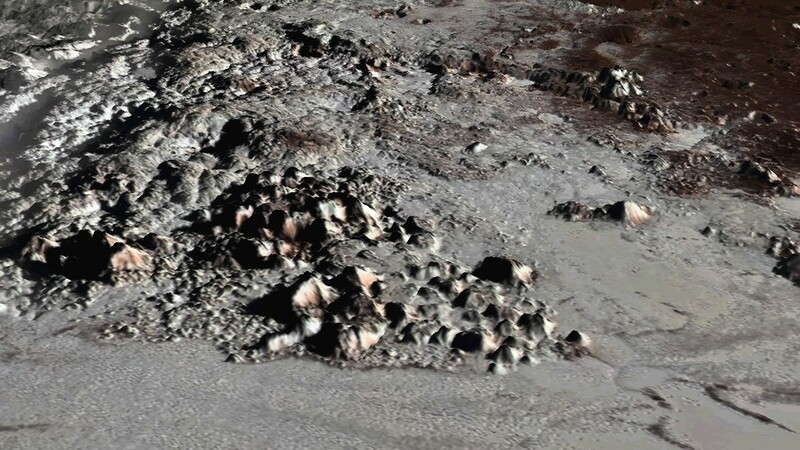 These mountains’ heights confirm scientists’ theory that they are composed of water ice, the only ice on Pluto powerful enough to hold them up. Pluto’s other volatile ices, methane and nitrogen ice, are not strong to hold up such structures and keep them from collapsing. Large scale features that were not immediately clear in the global mosaic map are revealed in the topographic one. For example, the latter shows that the center of Sputnik Planitia and its edges have different ice depths. At the center of the 625-mile (1,000-kilometer) glacier, the ice is 1.5 miles (2.5 kilometers) deep while at its outer edges, the ice is 2.2 miles (3.5 kilometers) below Pluto’s mean elevation, the equivalent of sea level on Earth. Near Sputnik Planitia’s western edge, the topographic map shows an area of highly eroded ridges and troughs stretching north to south for approximately 2,000 miles (3,000 kilometers). This longest-known feature on Pluto is evidence of extensive ancient fracturing. Why such fracturing occurred only in this region and not on other parts of Pluto remains a mystery. On Charon, the topographic map shows mountain ridges with heights ranging from 2.5 to 3.1 miles (four and five kilometers) and very deep troughs extending 8.7 miles (14 kilometers) near the north pole and also between the northern and southern plains. Blocky and fractured terrains in the north could be the results of ancient cryovolcanism that transported the rocks from the large moon’s deep interior. The mountain ridges and fractured regions on Charon are believed to be the results of the freezing of an ancient subsurface ocean. Both topographic maps have been archived with NASA’s Planetary Data System and are available to scientists and members of the public. Two papers on the topographic map were published in the journal Icarus, one on June 11 and the other on July 3.